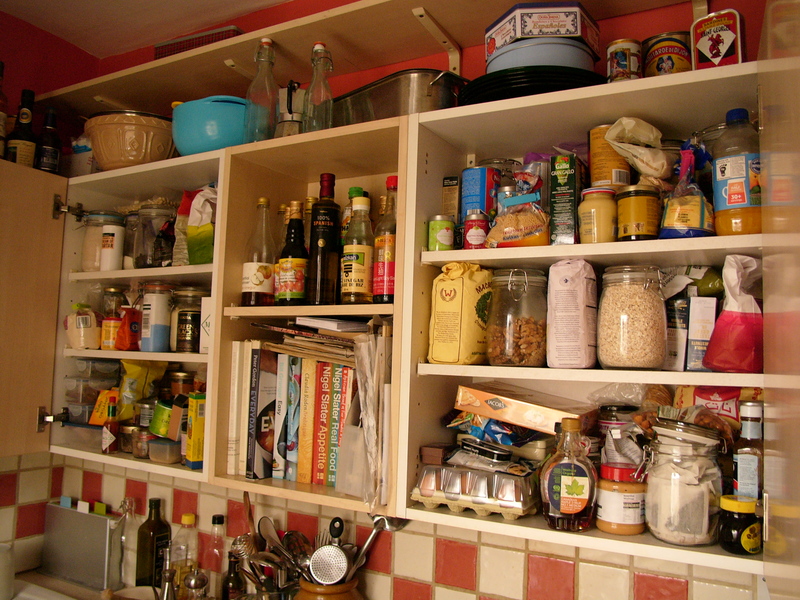 Cupboard love | WTF Do I Eat Tonight? Happy New Year! I hope that your festive season, if it was festive, was full of good food and drink, lovely people and no nasty lurgies. As ever, I ate, drank and spent too much and although I have no plans to go on any kind of food diet, hoping that the simple acts of moving more and eating fewer cakes will balance me out, after an autumn where work was as thinly spread as January sunshine I am in distinct need of a financial one. However, in food terms, this doesn’t faze me and, in some ways, it rather intrigues me. Food prices are due to go up massively this year so, rather than being a temporary blip, I sense that making the most of less is going to become part of daily life. And since I hate waste and love the alchemy of creating something extraordinary from the everyday this need to simplify, save and yet innovate is very appealing. This, as many people greater than me have already worked out, is the age of frugal innovation and I, for one, am planning to imbue my life, particularly my cooking life, with a little bit of that spirit starting right now with a month of recipes inspired by my cupboards. As anyone who reads this blog will know, I divide the required ingredients for recipes into things that you might have in a cupboard/fridge, typical things like flour, oil, milk and eggs and the less typical or perishable, like meat, fruit and vegetables or flavourings (e.g. soy sauce, herbs and, er, pomegranate molasses), that most people, including myself, will have to shop for. But I have never actually sat down and thought about what exactly is in my cupboards when I do this, or what might be in yours; the distinction has always been instinctive not calculated. Obviously there is no way I can try and devise a perfect list, since no two kitchens, or tastes, are the same in terms of size or preferences. But in order to conduct this experiment, of seeing how much I can make from very little, I thought I would start by throwing open my own cupboard doors so you could have some sense of what I store myself. As you can see below, I have two kitchen cupboards, separated by some shelf space, plus a tiny fridge (see, wasn’t kidding was I?). There are a few bottles on the surface, a bowl of fruit and another bowl with onions but that is all the storage I have. Southfork this is not. Despite having such a small ranch, I do manage to cram in an awful lot of stuff and that, combined with my proximity to a) Waitrose b) a very good Turkish greengrocer’s and c) a Chinese supermarket means that I am rarely two ingredients short of a picnic. And since this month I plan to find recipes that rely heavily on storage, not shopping, let me share with you what I will be using. I almost always have the following at home; it’s not an exhaustive list, which would bore you senseless, just typical. 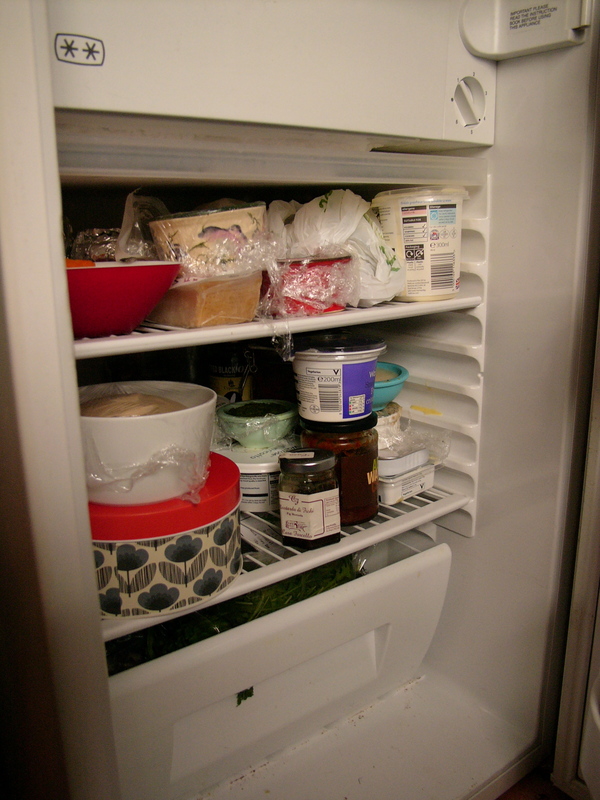 This entry was posted in Seasonal store cupboards and tagged basic cooking, cheap recipes, frugal innovation, storecupboard recipes, thrifty recipes. Bookmark the permalink. Happy new year to you too Louise. Ooh looking forward to your frugal foodie inspiration. Noel and I have committed to a regular Riverford organic veg delivery – the highlight of our week! Even welcomed a bag of brussels into our home today now I have discovered I can use them like cabbage in a fantastically tasty and simple Madhur Jaffrey recipe (Green Cabbage Sabzi from her Ultimate Curry Bible) – only 9 ingredients in total and that includes salt and oil. Let me know if you would like the recipe. Hopefully see you in March for some Loopiness. (I always add about 2 tablespoons of dessicated coconut as well because I like it and it adds another dimension). Put all ingredients except oil into a large wok or wide pan. Add 120 mls of water – stir to mix and cover well. Bring to boil and then turn down to simmer – cook gently for about 10 mins or until cabbage completely wilted and almost cooked. Remove the lid, add oil and increase heat to high. Stir and cook for 5-6 mins or until all the liquid has evaporated and you are able to stir and fry the cabbage briefly. Not sure how much the tomato adds – sure I have done it without before. Going to do it tonight with my rather sad looking brussels!